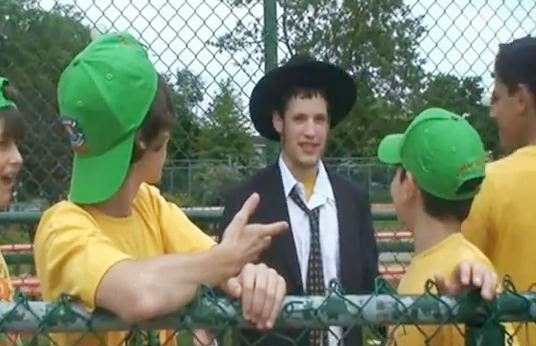 Back in the 1990s Abie Rotenberg, a prolific Orthodox Jewish musician, composer, and entertainer from Toronto wrote a song with a Country and Western flavor about a baseball team from a Brooklyn yeshiva. The team had some bad luck and was about to lose an important game when a surprise pinch hitter came in to save the day. The song was played on Jewish radio stations along with some of his other songs from a series of albums called Journeys. But the song developed a life of its own when YouTube came along and offered opportunities for schools and camps to create their own video versions. One version that we're sharing with you today is from a Chabad camp in Montreal called Camp Gan Yisroel in Ville Saint-Laurent and Town Mount Royal. Wishing you happy last days of Pesach. We'll be back on Wednesday with more of our mix of fun, nostalgia and Yiddishe nachas.